Includes: clipper, six accessories (attachment combs and styling combs), red blade guard, cleaning brush and oil. A metal housing, an ergonomic designed chrome lid, a super charge V5000 motor, and long lasting high carbon steel blades combine to make the Sterling Reflections Senior Clipper a real performer. 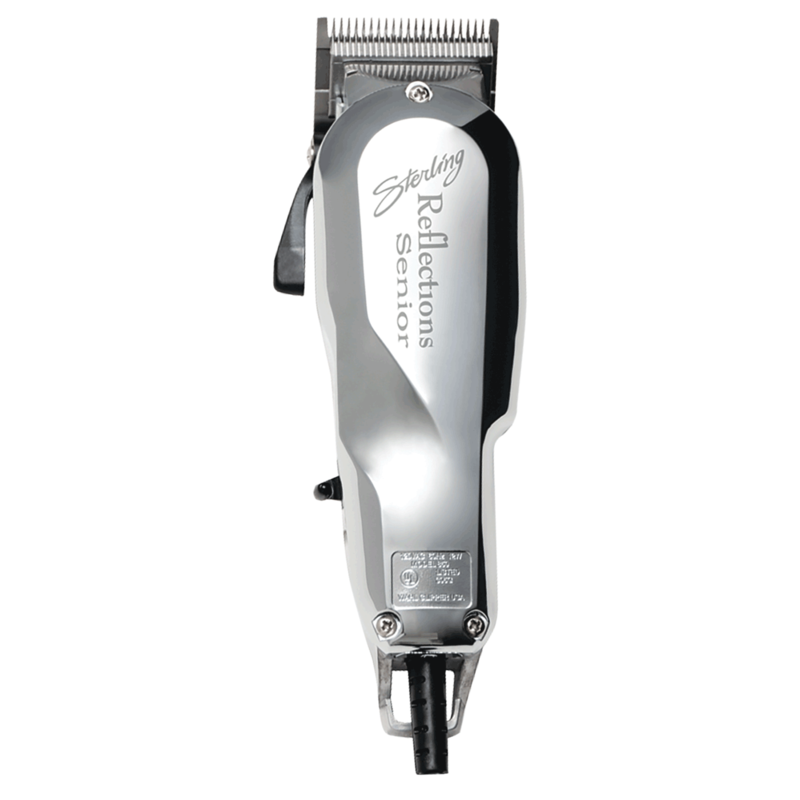 Super charge V5000 motor, and long lasting high carbon steel blades combine to make the Sterling Reflections clipper a real performer. "The blade cuts and fades beautifully. It is a durable clipper. Kind of on the heavy side." "I've had this clipper for nine months and the motor is giving out. It worked great at first, but I do a lot of men's cuts so I have to replace it." "The cord is not attached well, and breaks easily. Buyer beware." "I've owned this clipper for 2 years and it gets as close today as the first day I bought them. I've had other girls in our shop use them and they fall in love. I do 14 to 25 cuts a day, 5 days a week. Definitely got my moneys worth. Now ordering a back up just in case these die." "I agree it only lasts about 9 months until you need to replace them"
"I remember when I first purchased these the alignment was screwed. and unfixable, the screws wouldn't tighten all the way. I had to trade them in for a new pair, which worked but then they started over heating way to quickly, like a little passed 5 minutes in a haircut and I wouldn't dream of using them on someone if they wanted a 0. Then when I had to clean them out and re align them again it NEVER aligned properly again, it over aligned itself so if I wanted to actually have it at a 0 there would be a 100% chance I'd shred someones head. I haven't even had these a year." "Bought them to replace my school ones. They ran really hot right out of the box. It seemed to leave track marks too, like you could see where the card went through the hair even if you went over the spot over from all different angles. Maybe like someone else mentioned, the alignment on them is messed up. Not worth the money unfortunately."